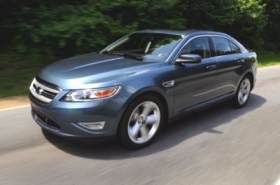 DETROIT -- Ford Motor Co. dealers are having trouble getting some versions of the 2010 Taurus, such as SEL and SHO trims. That's because Ford misjudged which variants of the vehicle would be popular and how many should be built, says a top executive. The 2010 Taurus went on sale in August. “It's a problem for our dealers,” said Jim Farley, Ford's group vice president of global marketing, at a press event Friday. One dealer, who asked to not be identified, just got his first 2010 Taurus after an 80-day wait for it on a sold order. He said he only has a 30-day supply of all vehicles but is able to trade with other dealers to keep sales going. Ford has sold 38,361 Taurus sedans through November, down 22 percent from a year earlier in the weakest U.S. auto market in almost three decades. Ford's total days' supply of vehicles is in the 60- to 70-day range, Farley said, which is good. “We're definitely catching up on the demand,” he said. Farley also said Ford underestimated the popularity of the F-150 double-cab. He said suppliers tool up for a certain mix of trim levels estimated by Ford. “If you don't call it, you miss that opportunity and customers don't see what they want to buy,” he said. Ford will do more “market acceptance research” on new models six months before they come out. Farley said one of the most important parts of Ford's “Fiesta Movement” -- a social media marketing program in which Ford lent the car to 100 people to test drive for six months -- was to gauge exactly what consumers would want to buy. The Fiesta is due in showrooms next summer. “We have 100 customers and they all have friends and they told us exactly what they would buy,” Farley said. Similarly, Ford is offering a reservation system for the Fiesta to learn which variants of the car it should build based on what customers order.